What is the netZcore Commerce Suite? The most affordable All Campus card and credential solution in the industry. 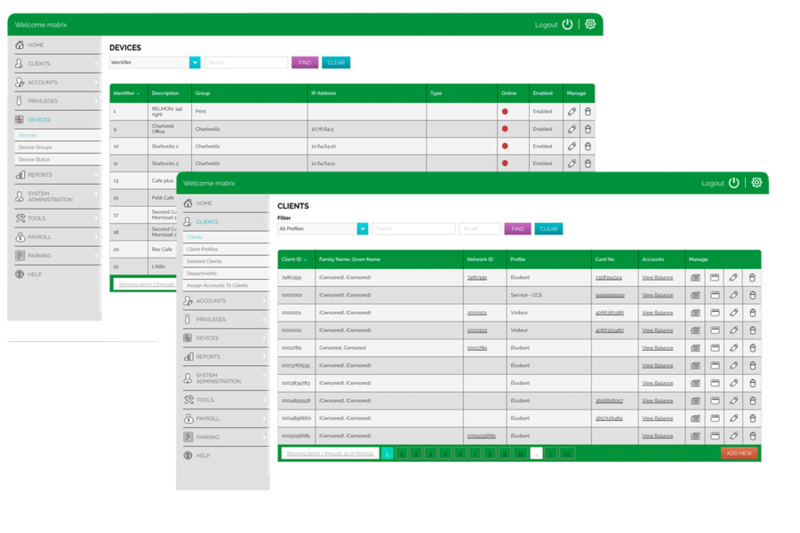 An easy-to-use web-based application that is fully integrated with your back end database. System administrators have full access to the application, and are in control of providing operators authorization rights based on their designated user role, allowing vendors and off campus merchants to receive sales reports for only their operations. 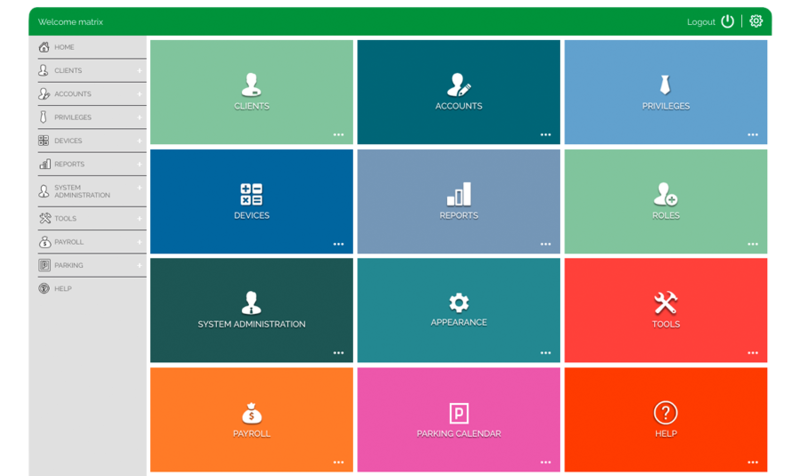 The business intelligence module empowers administrators with all the tools needed to make business decisions. 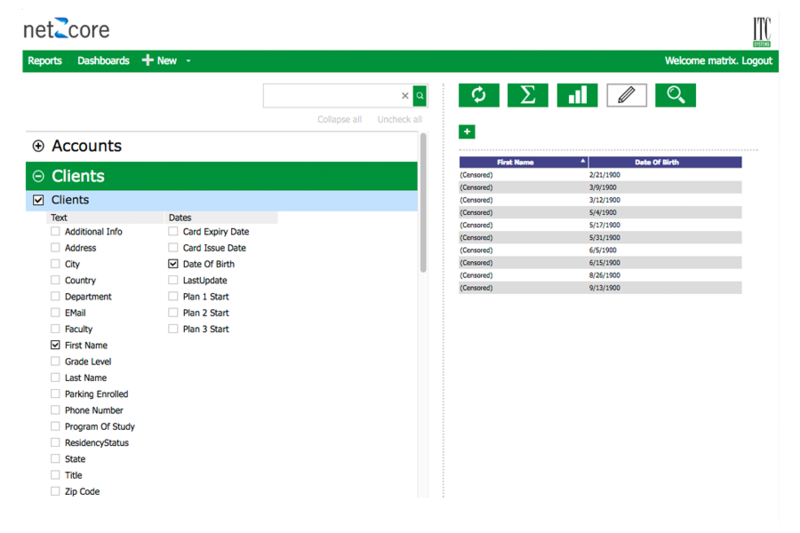 Dashboards that can be customized on the fly, data analysis that drill down to critical details that impact operations and reports that can be designed and automated in just a few clicks. The student experience is second to none with all the services they want, including some built into apps for their smartphones. Web Purchase Mobile is the one stop shop for account management; viewing transactions, updating profile, adding value to accounts, buying meal and privilege plans or mobile ordering and payments. Parents can be granted access to top up student accounts in a secure and user friendly manner, while maintaining cardholder privacy. A true modular solution that will grow with your campus. Your ITC Systems’ consultant will help you choose the perfect solution for your institution’s needs and work with you to customize your systems. netZcore’s architecture is scalable to accommodate a single site or large multi-site network of POS and UPOS locations. netZcore is the most advanced transaction engine for commerce in an institutional cost recovery and cashless solution. This powerful backend software integrates site wide terminals using a variety of application specific modules to centralize and report all transaction data. netZcore Engine is the software’s main program and is accessible via the web on a secure connection. The database it utilizes is Microsoft SQL, either Express for smaller locations of Enterprise for larger installations. This is the core of the suite program modules that make up the software suite netZcore. netZcore consolidates the revenue producing areas on site, providing a superior management method for transactions throughout a campus or institution and acts as a central management for your All Campus Card. Fast, Simple and Efficient! netZcore Purchase gives cardholders access to their account funds, privilege plans and settings right from their smartphone. Today, everything is done on the go. Checking your email, doing online banking, and now tracking your student card accounts. Stop second-guessing whether you have enough money left on your card to buy lunch or pay for printing. 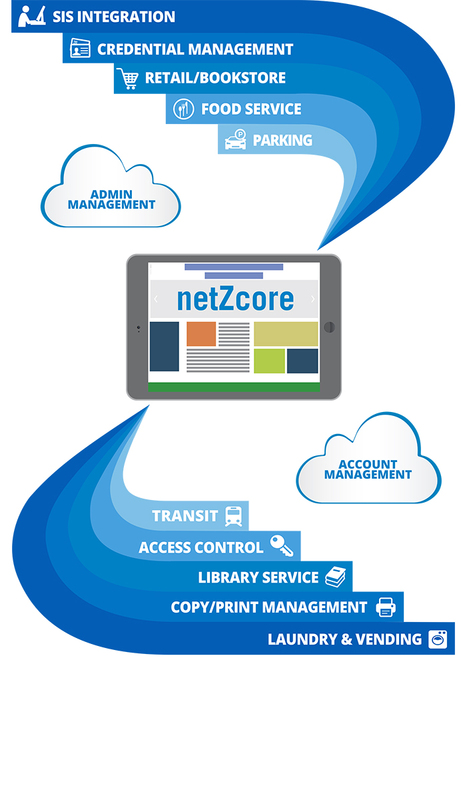 netZcore Purchase is a self-serve account management platform where students, parents, and other authorized users to can perform account functions to their One Card credentials over the web on a PC or a mobile device. With netZcore Purchase, students and authorized users have the options to add value to their One Card account, change their PIN, suspend their credentials, easily review account balances and perform a variety of purchases. netZcore Purchase accepts credit cards, debit cards or PayPal all in a secure PCI Certified environment. Give the right people insight into their data, when they need it, while maintaining the integrity of your organization’s existing security model. Modern users want instant insights into multiple data sets. netZcore Reports is the basic reporting packages available that provides all of the standard reports required to report on and operate the netZcore commerce solutions at your institution. The flexibility to manipulate existing reports in new ways makes it the most important part of the next generation of analytics tools. Clarify live data with rich dashboards, drill-down reports and data hierarchies to discover new patterns and trends. 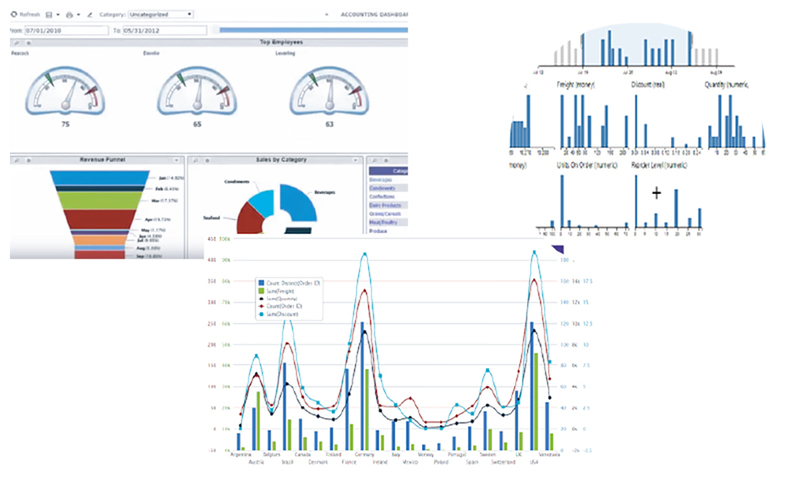 Dashboards are a dynamic and interactive tool for viewing critical information from multiple sources with a graphic and customized display of how your system is operating. Users can hover over a report to get details, or drill down into it for greater insight. 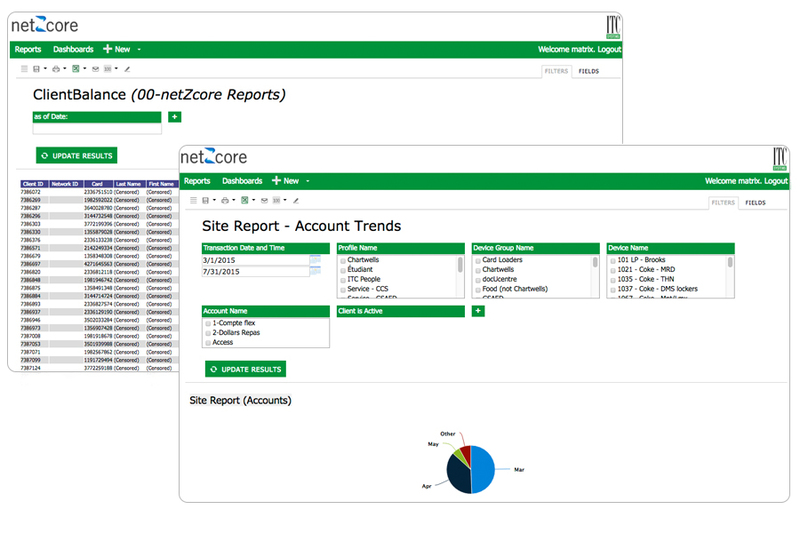 With netZcore Dashboard, users are given enhanced reporting functionality complete with fully customized display to display the criteria that is most important to the operation of your solution. Instantly see how your metrics are tracking within your environment. Stay competitive by providing real-time analytics for everyone, everywhere. Stay competitive in today’s global marketplace by responding quickly to real-time dashboards. netZcore Analytics provides an enhanced reporting package that gives the Administrator the tools to drill down into the data and provide effectively any statistic desired. netZcore Analytics opens up the database, thereby giving you virtually any statistic that you feel will help optimize the solution for your environment.